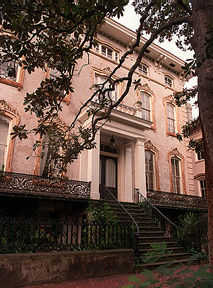 Savannah is a city steeped in history. 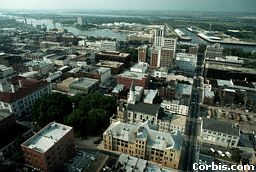 There are several ways we can see Savannah. I think the best way to see Savannah is to park the Chevy and walk. Yep, I said walk! As we stroll along and enjoy the sights of this old city, I'll try to relate a little of its history. 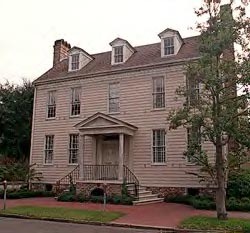 The first group of settlers landed in what is now Savannah on February 12, 1733, after a voyage of over three months in a small galley named the Anne. The group of colonists was led by James Oglethorpe, who founded Georgia. 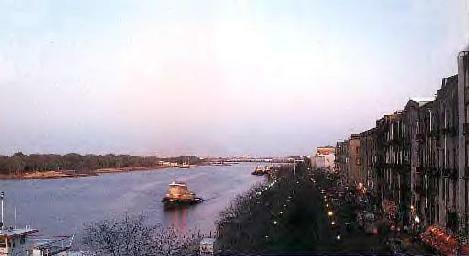 They settled on a small bluff overlooking the Savannah River. City Hall now occupies the very spot where Oglethorpe and his settlers first camped in the New World. Each male settler was given 50 acres. Each town square was organized so that the north and south sides contained residential buildings, while the east and west sides were reserved for public buildings. The colony fulfilled one of the hopes of England, but failed to fulfill the other. In 1742, General Oglethorpe defeated the Spanish at the famous Battle of Bloody Marsh. The Spanish never again threatened the English colonies. Meanwhile, the "Silk Hope", was fading. Georgia proved unsuitable for silk production and, instead, turned to rice and cotton. 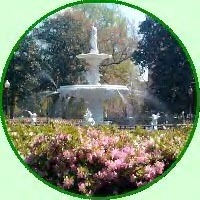 Savannah enjoyed great prosperity in the years following the Revolutionary War. Eli Whitney invented the cotton gin on a plantation up the Savannah River and the city soon became the world leader. 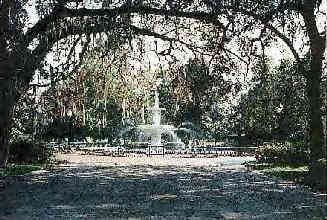 Savannahians applauded the S. S. Savannah as it became the first steamship to cross the Atlantic Ocean in 1819. South Carolina seceded from the union in December 1860, one month after Abraham Lincoln was elected President. Georgia, dependent upon slavery to support King cotton, quickly followed. For four bloody years, the war between the states raged. General Sherman ended his "March To the Sea" in Savannah. 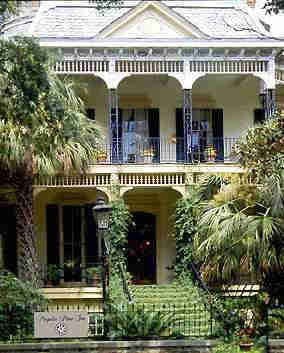 Although he burned Atlanta and many other cities, Sherman was so taken by the beauty of Savannah that, instead of burning her to the ground, he telegraphed President Lincoln and presented Savannah as a Christmas gift. 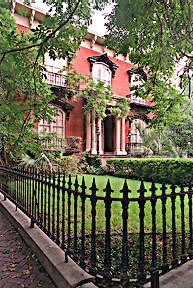 In the years following the war, Savannah suffered as cotton prices declined. Many of her architectural treasures were lost to demolition, neglect or natural disasters. One of the brightest spots in Savannah's history is when Juliette Gordon Low founded the Girl Scouts in 1912. 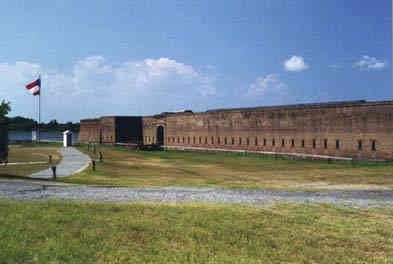 This is Fort Jackson, a Confederate post which guarded the approach to Savannah from the Atlantic Ocean. 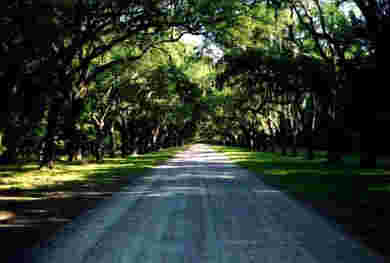 The famous oak-lined drive of Wormsloe Plantation. It often takes a spark to rekindle a fire. 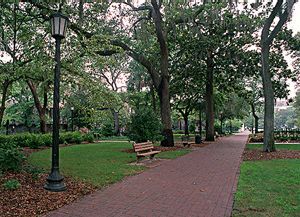 Savannah received such a spark in 1954 when a large portion of the City Market was destroyed to make room for a parking garage. This action caused seven women to form the Historic Savannah Foundation, an organization given credit for preserving a large portion of the Savannah we've visited today. Hasn't this been a wonderful visit. While we're this close, let's go toward the ocean and see a little of Tybee Island. That's Tybee Island in the distance. 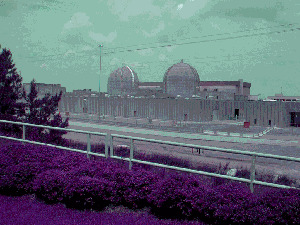 Tourists and area residents alike, love to visit here. The Pavillion makes a great place to have a picnic and watch the sea. 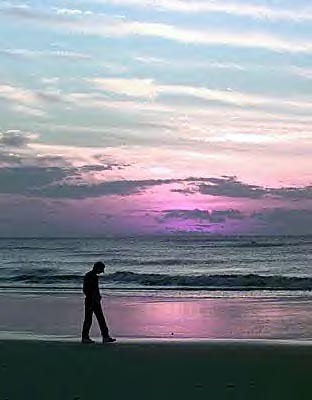 We could take an evening stroll along the beautiful beaches of Tybee Island. We have one more stop in Georgia to make, so we'd better all get back to the Chevy and we'll be on our way. 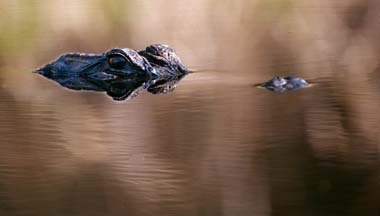 The swamp is located in southern Georgia. It is a Cypress forest. 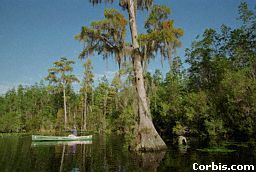 Cypress trees are easily recognized by the fact that they grow in water. When you are in this beautiful, exotic place and feeling in awe of everything around you, watch out! There's always something creeping around in the bushes. 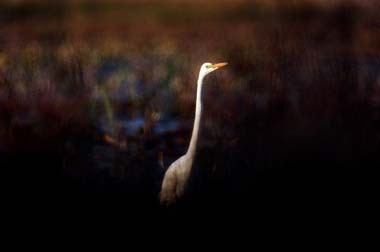 A lone Great Egret stands motionless waiting for his dinner to swim by. 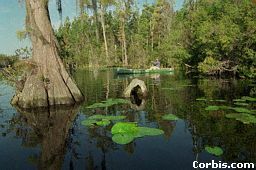 Stephen Foster State Park lies in the middle of the Okeefenokee Swamp. Canoeing in the swamp is a favorite pasttime. With all those gators around, I sure wouldn't want to fall out. This concludes our tour of Georgia. We hope you've enjoyed it, but now it's time to give the Chevy a good washing, waxing, tune up and gas up for our next tour. See you then.